Were you surprised when Apple decided to stop shipping Flash pre-installed with Mac OS X? I wasn’t. I posted the above screenshot last year after I experienced the most epic Flash disaster my Mac had ever encountered. We know Steve Jobs hates Flash, and, well, Flash on Mac OS X is generally pretty awful. But if you were wondering why Apple opted against shipping Flash pre-installed with new Macs, read on. Yea, it can be that bad. If I’m having a “good” Flash experience, it’ll only consume 40% CPU. How generous. 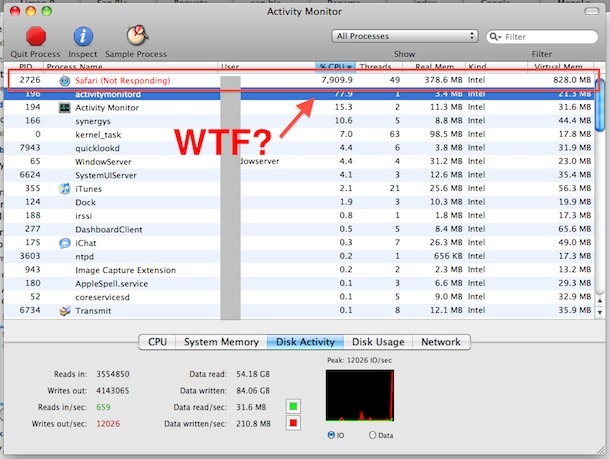 Now what if you’re a novice user, and you don’t know anything about the Mac OS X Activity Monitor? Suddenly your Mac is just painfully slow. 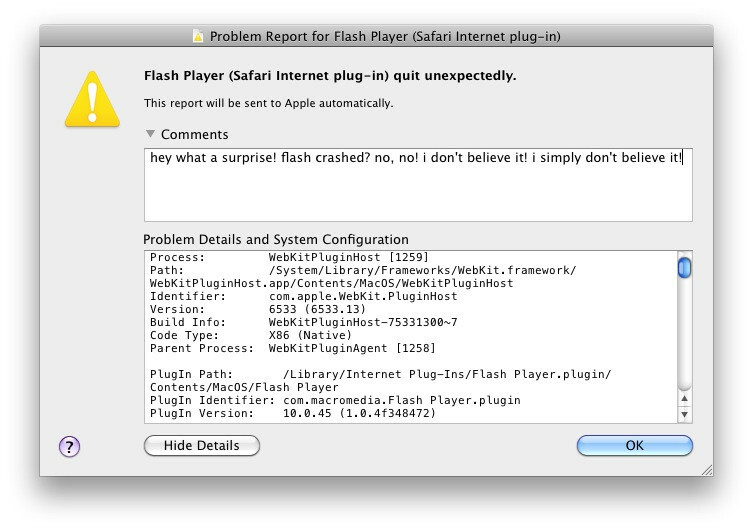 I wonder how many tech support calls and Apple Genius visits were caused by the poor functionality of Flash in Mac OS X? Was cutting Flash from the Mac a business decision or just a user experience decision? Maybe both? Who knows, but I think it was the right move. If you’re reading this and you’re confused, let me fill you in. Macs are no longer shipping with Flash pre-installed. This is a very recent change, and first noticed when owners of the new MacBook Air discovered that Flash was nonexistent on their shiny new portables. If you want Flash, you’ll have to install it yourself. DaringFireball confirmed with Apple that “in the coming weeks, all new Macs will begin shipping without Flash Player.”. I can’t say I’m surprised, and personally, my Mac and I are doing just fine with HTML5. The question now is, can Flash be saved? Or is this one of the final nails in the Flash coffin? Editor note: The reason Apple has provided for no longer pre-installing Flash on Macs is so users can download the most recent version themselves. This is valid, since newer versions of Flash should perform better and be more secure then older versions of the plugin. This is very good move, bold one, but good. Why is bold? Because every other company struggles with the same issues, but only Steve is not afraid to take action. I think that the Mac world will be a better place after this decision. Yes they do, it just the poor performance of windows as a whole masks Flash’s part in it all. Flash is a bleeder, literally. The reason that Macs are not shipping with Flash pre-installed is because Adobe updates the Flash Plug-in constantly, so the plug-in that ships is usually out of date. It isn’t because Flash is being banned or anything. Macs were the only computers that actually were shipping with Flash pre-installed. Windows never has any plug-ins pre-installed and neither do the popular Linux distros. This is a smart move as it ensures that users will download the latest plug-in. It isn’t a knock at Adobe. That said, I do agree that Adobe has much work to do to bring Flash up to par in OS X. Flash is horrible technology from the 1990’s, keeping it around is like keeping a cassette player in cars. If Adobe wouldn’t have slipped with the performance, they might have been able to keep it around longer. There is a lot of stupidity in this text : I have never seen any Flash web application consuming more than 8 % or 10 % of the power of the CPU. Without knowing about which websites and applications you are talking, I say that you written stupids words. Adobe has given up on the Mac platform! That is Flash crashing, AGAIN! I experience this several times a day. If I didn’t have to work with it, I would uninstall it completely. Clearly Adobe does not want to support or improve this software for the Mac user base. > I have never seen any Flash web application consuming more than 8 % or 10 % of the power of the CPU. The fact that flash works fine for one person isn’t really a good argument in favor of it when completely wrecks the user experience for other people. On a Mac this is an easy problem to document, and it is true for ANY site running flash content. I doubt the author documented which sites are causing the issue, because on a Macintosh computer, this is true of all Flash based web sites. I use Macintosh computers and any time a site uses flash, the CPU temp skyrockets. I use SMC Fan Control app to measure the CPU temps. For most of the Macs I use the systems average in the low 100s F. As soon as a site has any flash content the temps shoot to 180+F. This is true if the site has a tiny Flash ad, or a Flash intensive site like YouTube or Flash games. On my systems with poor cooling (I.E. Mac Minis or Mac Books), the heat caused by Flash will typically cause the computer to stutter or freeze up or in rare cases crash completely. @ John Doe – You did not state that you have a Mac or how you are determining your CPU usage percentage, but I’m assuming you are using Task Manager in a Windows PC. If you are not, then please check your facts, rather than making up numbers to support a false argument. Or you are Astroturfing, deliberately using poor grammar to make it look like you are not an Adobe employee. Simply put, Flash is currently poorly implemented for the Macintosh OS. Kudos to Apple for NOT carrying anyone elses’ water, especially that of a perpetually out of date & insecure sh*tty browser plugin. The whole point of this is this is NOT OS9, the internet DOES exist; Apple doesn’t need to bundle crapware on a DVD, if users want it then they can use that happyfun internet, download said crapware, put their admin password in and pollute their own machines. Then, when their machine starts spinlocking they can ask themselves ‘what changed?’ and then REMOVE IT. Third party crapware should NEVER be bundled by the platform vendor — that’s an HP, Dell, or Microsoft trick. NOT Apple. At all. Also: remember: why did both Google and Apple have to design ‘plugin sandboxing’ into their browsers? What was their main reason for doing so? Bueller? Bueller? Postscript: Saying Flash is ‘important’. Hah, that’s a good one. Just like animated gif & MIDI on web pages used to be ‘important’. Good riddance to Flash, I am just as thrilled to see it gone from the Mac as I was to hear it would never come to the iPhone. I use Monitor Activity to “see” what applications do. I haven’t read the other comments, but this article bugs me a little bit. Are you a flash or mac developer? I currently develop for both, as well as iOS and many other devices/platforms…including html5! As with ANY programming language, it takes a great programmer with the knowledge of “programming” in general, to make an application that doesn’t hog resources. It’s not FLASH that is causing you to have poor experiences…its poor flash developers! I think by jumping on the flash bashing bandwagon you are just showing off how little you actually know about the issue. HTML5 and FLASH are NOT competitors…They are two VERY different programming platforms. Apple didnt allow flash on their devices for one reason and one reason alone…It would have made their App Store obsolete. Why would ANYONE develop an app and share 30% of its profits with apple, when you could develop a flash version for a fraction of the price, and keep 100% of the cashflow. Cmon now, stop being irresponsible and spreading mis-information. Just because steve jobs says something, doesn’t make it fact, or even the truth. Have you seen the MoleHill 3D API Adobe just announced? They basically just claimed the web as their new HD 3D Gaming market. If you don’t know yet, you will soon, when you’re favorite console games are making their way to the browser VIA FLASH. I haven’t been doing any flash for a good 6 months to a year, totally focused on HTML5 (mostly because the clients don’t really know what they are talking about and REQUEST it for things they shouldn’t). HTML5 and FLASH go hand in hand, and there is no way to have a full and complete internet without them both. By the time HTML5 is even giving a majority of users its promised features, flash will be so beyond what html5 is at that time, it will be sad. w3c and html spec’s take WAY too long to keep up. Steve, you make a lot of good points and I agree with you on some of them, but in the end it’s the users experience that makes or breaks an impression of a product. Of course there is a profit motive to keeping things in the App Store, but it’s also a way to limit bad programming from marring user experience (like you said, this is often the problem with Flash). This gives credence to the strict App Store policies, whether developers like them or not. As for me, I’ve had repeatedly bad experience with Flash. I installed a Flash blocker plugin long ago and it has since saved my web experience. Considering how well Flash runs in Windows, I tend to think Adobe just hasn’t prioritized the Mac platform which is now biting them.